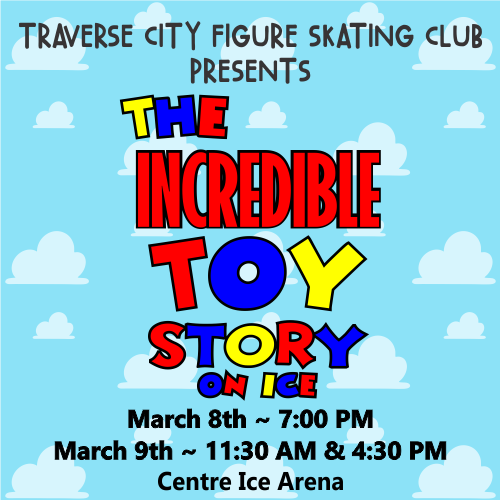 Traverse City Figure Skating Club presents "The Incredible Toy Story On Ice" brought to you by Hopscotch Brick Oven Tap Room and Performance Mindset Partners. Don't miss this INCREDIBLE production consisting of amazing local talent, choreography and costumes. Come be part of the experience. Dress as your favorite superhero or Pixar character and sing along with your favorite songs. This is a show for all ages. Children (and adults alike : ) are encouraged to come dressed as their favorite Pixar character or superhero. Phenomenal local talent ranging from 3 years old through adults. National, Sectional and Regional figure skating competitors. Amazing costumes, lighting and on ice props. You will hear awesome tunes from the Pixar movies and so much more! Be prepared to be Wowed! This is an accomplished INCREDIBLE production! It's one northern Michigan event you don't want to miss! For all ticket information call 1-800-836-0717 (for handicap seating information please call 231-519-0507). Tickets on sale at the box office the day of the event (IF not sold out). Experience the show up close and personal to the cast and crew. $150 per table (must purchase a full table). High top Table consists of 4 seats. Includes complimentary wine from Brys Estate Vineyard and Winery (for 21 & older). MUST be 12 years or older for on ice seating (NO EXCEPTIONS).